The barbell front squat is a phenomenal, yet seldom performed version of the regular barbell squat. This exercise directs a great deal of focus onto the front part of the thigh, especially the vastus medalis, which is the part of the lower thigh above the knee that looks like a teardrop, the rectus femoris, or center thigh, and the hamstrings. There is also an effect on the hips, lower back and to some extent, the abdominal wall. The front squat is not a replacement for the back squat, but if done effectively, can be a tremendous boost to overall lower body strength, development and flexibility. Front squats are tricky to get used to-but its important that you develop the technical skills needed to become comfortable with this movement. In the majority of cases, people feel awkward when first attempting this exercise, which often results in them failing to include it in their routine. This movement takes a certain amount of practice and there is a certain level of initial pain and discomfort which the body will adapt to over a period of time-just like when you first begin deadlifting-it takes time for the calluses to develop, but once they are there, you never think about it again-the same is true when you first begin performing the front squat. The benefits of including the front squat in a training routine can be tremendous if performed correctly. However, many people have difficulty with its performance because of the stress that it can put on the wrists-Fortunately there are several ways to facilitate and work around this. Begin by approaching the barbell in the squat racks and get underneath the bar and place it across your clavicles, as close to the base of the neck as possible. You can use some padding across the upper chest or what seems to give some added cushioning and traction is to simply wear an extra heavy sweat shirt when doing front squats. Raise your arms up until the bar is resting on the groove between the front and middle deltoid. You now have several options for hand placement and support. You can take a slightly wider than shoulder grip on the bar with the exact same position as if you were cleaning the weight from the floor. This is the best and most stable position, but it is difficult for those with very large arms, those with short arms, those who lack sufficient wrist flexibility, or those with a history of wrist and hand trauma. You will find that increased practice will increase the flexibility of your wrists and hands. 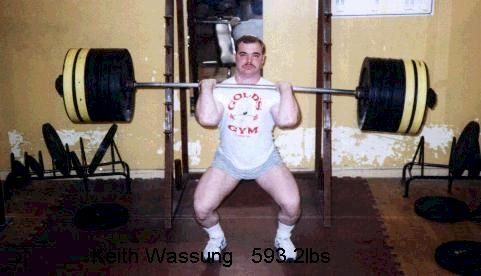 You may also want to practice actually cleaning the weight from the floor and then performing the front squat-doing this seems to set the bar into a natural position for most people. If you still lack wrist flexibility you can still support and balance the bar by keeping an open hand and just using the fingertips to steady the bar across the shoulders. You can also use a reverse clean grip, which is where the elbows are up and perpendicular to the floor with the palms facing the body, similar to a curl movement. Another trick is to take a pair of wrist straps and loop them tightly around the bar where your hands would normally be placed. Tie a knot in the end of the straps and then grab the base of each strap with the fists facing each other. This will put you into the same position as if you were using the normal front squat position. Keep your elbows high and parallel to the floor and you are ready to squat. The last method is to cross the arms across the chest, which is a popular method that bodybuilders use when doing front squats-this works especially well for those with thick development in the upper chest and shoulder region, but it is not as stable as the previous methods. You will want to begin this exercise with relatively light poundage-You will not be able to handle as much weight in the front squat as you can with a regular squat. It will take some time and practice to get used to the balance and the feel of the exercise bar. Take a stance that is about shoulder width with the toes pointed either straight ahead or slightly out. Looking straight ahead, take a breath and tighten your back muscles. When going down, you need to keep your knees lined up over the tops of your feet. Descend slowly all the way to the bottom position and without bouncing, start to release your breath and drive the bar back up. Keep your back muscles contracted and your elbows up during the entire movement. The real key is to hit rock bottom depth without any kind of bouncing or other ballistic activity. I realize that many fitness experts caution against full squat movements, but I feel that as long as the technique is correct, and there is no bouncing at the bottom, squatting rock bottom is the way to go. Begin by working in the 6-10 rep range for 1-2 sets per workout and then incorporate the front squat into your routine based on your training goals. Front squats will produce quad roundness and sweeps like no other exercise. The reason they are seldom performed is because they are so darn tough and demanding-but the results will be worth it! The Hise shrug, invented by Joseph Curtis Hise, who was often referred to as the "Father of American weight training" was a staple movement for strength athletes in the past. Today, it is seldom, if ever performed. In my 23 years of training, I have never seen anyone other than myself perform this movement which is unfortunate because it's an incredible exercise for upper back and even overall strength and development. To perform the Hise shrug, get into the exact position that you would for performing a back squat, with the bar high up on your traps. Stand erect and simply shrug your shoulders as high as possible to your ears. Pause as the top for a least a full second, lower and repeat. Coordinate your breathing so that you inhale as you shrug upwards and exhale as you let the shoulders back down. Start with moderate weights to get the form down, but eventually the goal is to use very heavy weights for very repetitions in the 20-25 range. This exercise will hurt-I can promise you that-but you will be rewarded with increased growth in your upper back and traps. I have also found that it also helps to establish a solid base for positioning the bar when doing squats. Another version of this movement is to get into a standing calf machine with a solid foot placement and do shrugs with the yoke of the machine across the top of the shoulders. Use the same formula as the traditional Hise Shrugs-one heavy set of 20- 25 reps. I would perform the Hise Shrug at the end of the back workout as it can be quite taxing. As is true with life and in the gym-if you are willing to pay the price that others will not-you will reap the benefits that others will not"